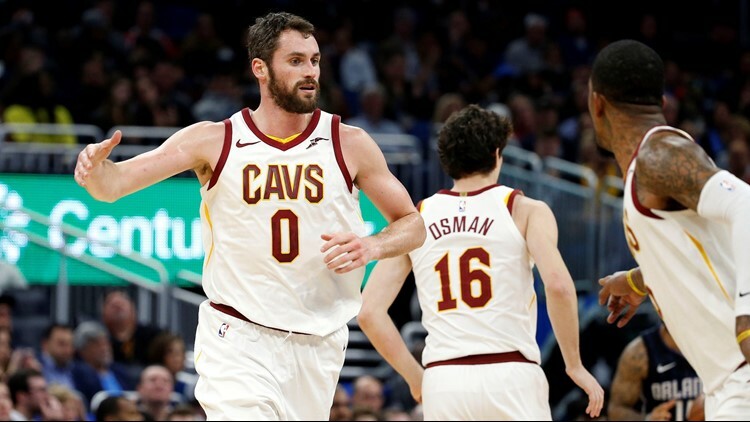 After agreeing to a four-year extension with the Cleveland Cavaliers, Kevin Love signed his new deal in front of a group of team employees and construction workers at Quicken Loans Arena. CLEVELAND -- Agreeing to a four-year extension worth a reported $120 million, Kevin Love is staying in Cleveland. And when it came time to put pen to paper on his new deal with the Cavaliers, the 5-time All-Star did so in memorable fashion, signing his new contract in front of team employees and construction workers at Quicken Loans Arena. Although the contract signing wasn't open to the public or the media, it was captured on the Cavs' social media streams. "I'm just very excited, obviously very humbled. I'd just like to thank the Cleveland Cavaliers organization and Dan Gilbert, obviously [general manager] Koby [Altman] for having their trust in me and believing in our future," Love said. "When I got traded here a few years back, I was committed to being here long-term. I was committed to our culture and excellence in playing the game of basketball. I think with who we have on our team and who we have moving forward really reflects that." Although the Cavs will be dealing with a much different set of expectations with LeBron James now in Los Angeles, it didn't take long for Cleveland to find the new face of its franchise. In four seasons with the Cavs, Love has averaged 17.1 points and 10.0 rebounds in the regular season, earning All-Star selections in 2017 and 2018.